I admit that this doesn’t look much different to the usual mystery objects, but this one is reputed to have certain powers. Can you work out what these powers may be and where in the world this superstition comes from? Of course, the first step will be to identify what the object actually is. As usual you can put your suggestions, observations and questions below and I’ll do my best to answer. Well I’m pretty happy it’s the paw of a mole (or something very similar). But the mystery powers and implications are beyond me. Well it’s not a rabbit’s foot, that’s all I can say. You’re absolutely right – it’s not. I never got that – if the foot was that lucky surely the rabbit wouldn’t have lost it in the first place. Would this be an East Anglian mole? So I’ve dug around a bit and unearthed some good old superstitions. Personally I think such beliefs are a bit short-sighted. Are they charms against cramp? Use the manus for curing arm cramp and the pes for leg cramp. If you get it the wrong way round it makes matters worse. Also, arthritis and toothache can be cured with these things, but only if the animal was still alive when you remove them. People believe the strangest things. I think it looks like a mole’s paw, but I’m suspicious as it seems a little too easy…. Thinking it’s an albino mole due to the light colour of the fur, not a clue on superstitions though. There’s something about albino Moles’ being seen as good luck tokens in Nigeria…? I also thought of a moles foot, I believe carried by scots for good health a few centuries ago. I’d like to know what diseases they thought it could cure though. Enid Porter’s book ‘Cambridgeshire Customs and Folklore’ lists that those living in the Cambridgeshire Fens believed that if they had mole’s paws on their person, it would cure tooth ache or rheumatism. They would carry the moles paws in their pockets or around their necks. The cold and damp conditions in the fens were notorious and thought to cause rheumatism. Most of the jobs had to be done outside such as: peat digging, reed and sedge cutting. This would aggravate their condition. Fascinating stuff – I doubt the efficacy myself. I should add that this isn’t from Cambridgeshire. Naughty Paolo. No scale bar AGAIN. Looks like Ratty’s river-bank companion, though, if it’s not a Yeti or something. Could be a Wampa from Hoth. Apparently it was bad luck to come across one. Scale bars are for science, not superstitions! It’s your lucky chupacabra paw. Is this a naked mole rat paw? That’s about the only thing that this would probably work for! But seriously, is it a golden mole? ( (Eremitalpa granti)? ‘Fraid not – nothing so glistery. I’m going to pump for Chrysochloridae – the golden moles of southern Africa. They appraently have a talent for detecting sound through their bones but I’ve no idea of any connections with superstition. I thought that all mammals detect sound through their bones? Well, three bones in particular. You’re right that the Chrysochloridae have an unusually large malleus that helps preferentially amplify the low frequency sounds needed to detect vibrations from the surface of the ground. 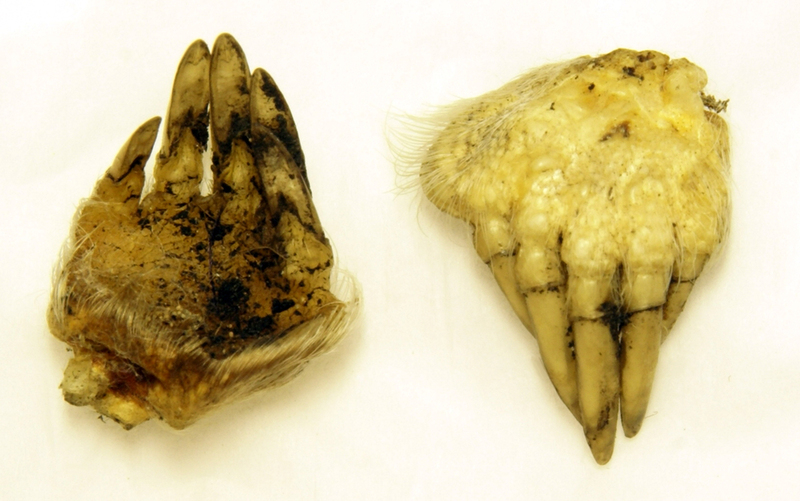 Also found reference to an old hoodoo belief that if a woman wants to stop a man leaving her, she should put a mole’s toe in a bag and wear it on her leg. Is that what our little mystery object is for? Thanks – I’d not heard that one before. To me it seems more likely that finding a severed mole’s toe on your girlfriend’s leg would encourage a hasty departure! This mole didn’t lose its digits for love though.